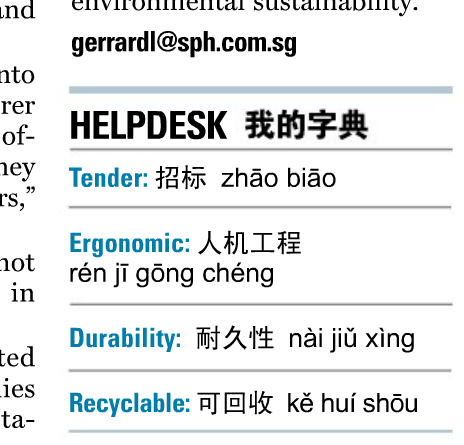 The first thing I like about the paper is that it's available in both English and Chinese. 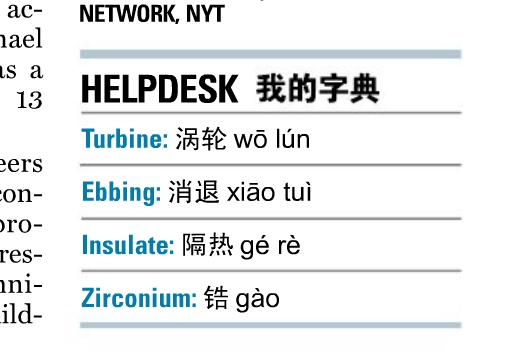 That's really useful for Mandarin students. So if you're looking to learn current and relevant words, or to practise your reading, try to spend some time at the MyPaper website - I'm impressed. We have Idioms in English. Every cloud has a silver lining. The early bid catches the worm. Better late than never. But as many as we have (and as many as you were forced to memorise during your years at school) nothing comes close to the Chinese system of Chéngyǔ (成语 / 成語 - which means 'set phrases'). 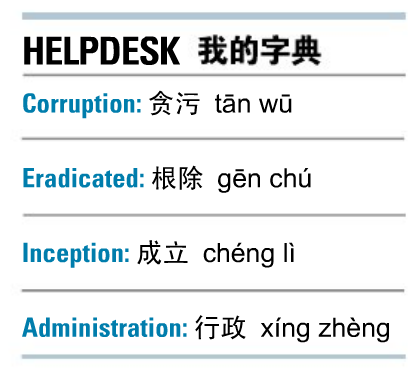 Chengyu, in the strict sense, are four-character idioms, and according to Wikipedia there are over 5000 of them. Children spend a lot of time learning them at school, so you can be damn sure you're going to come across them often. This post is not to get you like Chengyu, or even to start memorising them. But it's what happened in my own Mandarin-learning life around these idioms - just an unconnected series of personal anecdotes (although if you can see the hidden connection then well done!). I had heard about some Mandarin students dedicating a lot of their time to learning Chengyu, but at the time I was thrilled if I could just remember how to say "I'm from South Africa" in decent Mandarin. So I promised myself I would never memorise any. Unfortunately, as your level increases, you can't avoid them - they come up more often that you'd like. My first Chengyu was in a London dimsum restaurant called Ping Pong, which has the ceiling covered in a wall-paper with Chengyu written all over it. At that stage, my reading skills were rubbish, but looking around I saw one that I could actually read! 开门见山 (kāi​mén​jiàn​shān). Literally, this is: open door see mountain. Can you work out what that means? Open door see mountain. I had fallen in love with Chengyu. So simple, so direct. Wow - I could memorise millions of these! A few days later I was speaking with a Chinese friend about my new-found love, and she asked me what that particular Chengyu meant. So I explained my understanding: It was kinda like Nike's "Just do it!" Open the door, see the mountain. It's right outside. But I was wrong, she explained. The actual meaning is "Get right to the point." This was so annoying, for two reasons. Firstly, she was right - I spoke with several people, and looked up several resources on the net, and she was right. Secondly, my interpretation made more sense than hers. But no matter how much I argued, I couldn't change a few thousand years of habit for the Chinese. 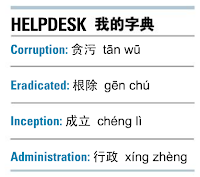 Chengyu were not obvious, they were not simple. And I hated them. Have you lost your horse? Some Chengyu require you to understand the back-story to understand the meaning. So with "open door see mountain", although my definition is better than the actual definition :-) at least now that I know what it should mean, I won't forget. But take for example, 塞翁失马 (sài​wēng​shī​mǎ). You can spend as much time as you want with the dictionary, you're not going to get it yourself. If you get the literal translation, you've got something like "block old-man lose horse". What? Actually, 塞翁 is the name of a person - it has nothing to do with blocking old men from losing their horse. The back-story is in fact well known to Westerners, in various guises. Basically, Saiweng has a horse that runs away, but he doesn't take that as bad news. Months later it comes back with another, but he doesn't take that as good news either. His son then goes riding on the new horse and breaks his arm - which Saiweng doesn't take as bad news. Then a war breaks out, and his son avoids conscription because of the broken arm ... and so on. A man takes a ride in an airplane. 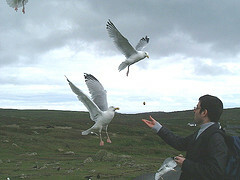 Fortunately he has a parachute. Fortunately there is a haystack below him. Unfortunately there is a pitchfork sticking out. Fortunately he misses the pitchfork. Unfortunately he misses the haystack. I was reading through Carl Gene's excellent blog, and in his one post about love idioms, I saw the following: 藕断丝连 (ǒuduànsīlián), which he describes as follows: "The lotus root is severed, but linked by threads. This chengyu metaphorises the idea of a relationship breaking up, but still being connected in some kind of way." Nice concept, but frankly I had no idea what he was talking about. Lotus root threads? What? So I did some searching, and came across the following really interesting article, with a whole bunch of pictures. 画蛇添足 (huà​shé ​tiān​zú​) - literally "paint a snake, append a foot". Its meaning is to do with over-doing it, or to do something superfluous to ruin the effect. 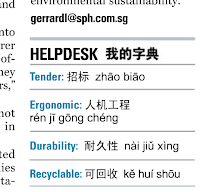 That's a great Chengyu (although I still haven't had the chance to use it)!